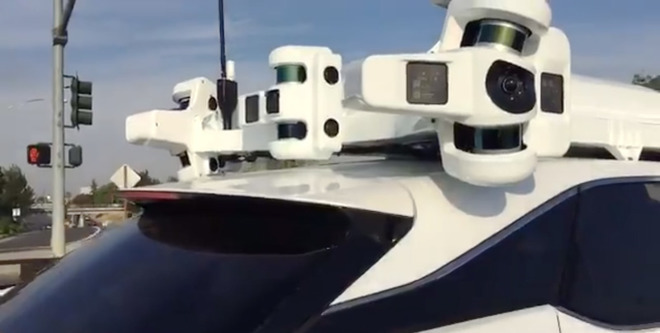 Apple now has 55 autonomous test vehicles and 83 authorized drivers, California's Department of Motor Vehicles has confirmed, indicating that work on the company's mysterious car platform is accelerating. In California at least the new number puts Apple ahead of Drive.Ai, Tesla, and even Alphabet's Waymo, which is rapidly advancing towards a commercial ridehailing service. The leader in the state according to macReports is GM Cruise, with 104 vehicles. Apple's reported fleet size earlier this year was 45. The company has yet to apply for a permit to test without backup drivers, but those only became available in California last month. Businesses around the world are racing to be among the first with fully self-driving vehicles. The technology is considered the future of the auto and ridehailing industries, and lucrative for any company that can establish itself as a frontrunner. Apple's own goals are still unclear. While it was at one point thought be designing a full-fledged electric car, its work has allegedly narrowed to creating a platform, possibly with ridehailing in mind. Unless the company engages in a major investments though it will probably have to partner with one or more outside firms, since it lacks the expertise and infrastructure to run its own Waymo-style ridehailing. Building a self-designed vehicle would be even more complex, since it would need to partner with manufacturers, supply parts for decades, and ensure easy access to repairs. Unless it made an announcement well in advance it would also be difficult to keep the product a surprise.